This is along the 405 Freeway in Carson CA, about 10 miles south of LAX. 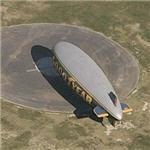 It's Goodyear's LA blimp parking facility. Blimp used to be in the GL map but was 'updated'. It is still in the LL Bird's Eye View maps though. 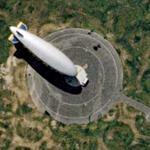 Blimp no longer in image after Google Local database update on January 23, 2006. This is so awesome! I'm from Akron and we do love our blimps. I emailed all my family after seeing this. I mean what are the odds of the blimp being out on the day they take these types of shots.